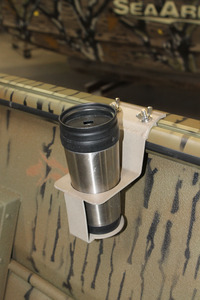 Our caprail cup holder is a handy accessory. Move it around any where on the boat to make it convienient to reach your drink. The holder is able to fit soda cans and standard size glasses. Dimensions: 4" x 3 3/4" x 3 3/4"